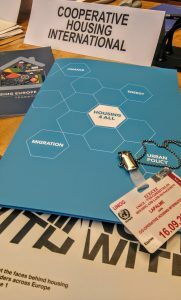 On September 15 & 16, 2016 at Palais des Nations in Geneva, Co-operative Housing International joined with the UN Economic Commission for Europe, Housing Europe, UNECE, the Slovakian Presidency of the EU for a capacity building conference that aimed to deliver a roadmap of suggestions for the housing policies of our future in Europe and beyond. This was also the 2016 Housing Europe General Assembly. Nicholas Gazzard, CHI President, opened the conference, other speakers included Anders Lago from HSB Sweden, Dr. Christian Lieberknecht from GdW Germany, Blase Lambert from the Confederation of Co-operative Housing UK, Dermot Sellars from Co-operative Housing Ireland, and Pasquale Talerico from Kalkbreite Co-operative in Switzerland.